This image is taken from a rare book held in the Chapter Library at Windsor. It was printed in 1684 and is entitled Bucaniers of America: Or, a True Account of the Most Remarkable Assaults Committed of late Years upon the Coasts of The West-Indies…more especially, The unparallel’d Exploits of Sir Henry Morgan. The author of this work was a Dutchman named John Esquemeling. He describes himself as “one of the Bucaniers” (title page); it is thought that Esquemeling was a surgeon who enlisted with the Buccaneers for a short time. After setting the exotic scene for his European readers, Esquemeling provides brief descriptions of the exploits of early Caribbean pirates before focusing on the notorious Sir Henry Morgan. Originally from Wales, Morgan arrived in Jamaica in 1655 as a junior officer in an expedition sent by Oliver Cromwell and gained his reputation as a pirate in the 1660s and 1670s. The image illustrates one of the most exciting passages in Bucaniers of America. 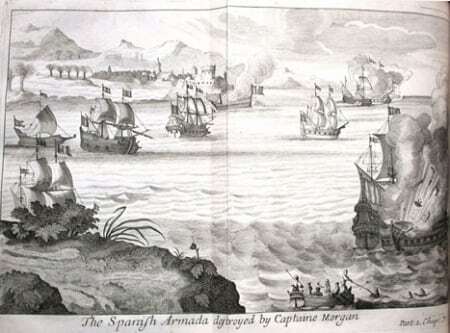 It shows Morgan’s triumph over the Admiral of the Spanish Fleet, Don Alonso. Don Alonso issued a letter demanding that all of the booty taken during the raid on Gibraltar be returned or he would cause them “utterly to perish”. The pirates resolved to fight and trick Don Alonso by creating a cleverly disguised Fire-ship; below deck was filled with pitch, tar and brimstone while the decks were “beset with many pieces of Wood dressed up in the shape of men with Hats…and likewise armed with Swords, Muskets, and Bandeleers.” The scheme proved successful; one of the Spanish ships was captured and another sunk – from which was later recovered 15,000 Pieces of Eight. Morgan was technically acting for British government trading interests by weakening the Spanish position in the Caribbean; he was therefore a ‘privateer’ and exempt from the usual charges of piracy. However, the author Esquemeling tends to ignore this distinction and refers to Morgan and his men as “Pirats” throughout the book. This is not an entirely unjustified approach because, although Esquemeling makes the narrative exciting and dramatic, he is also aware that Morgan rarely acted altruistically or mercifully. Morgan’s crew were known for debauched living and a fixation with “Wine and Strumpets”; Morgan and his crew were also involved in several appalling incidents of civilian torture, such as that which took place at Maracaibo where “all sort of inhumane Cruelties were executed upon those innocent people…for the space of three whole Weeks.” Additionally Morgan gained great personal wealth from his raids, which enabled him to become one of few ‘pirates’ to die wealthy and of natural causes. This second edition of Bucaniers of America held at St. George’s is an amended version following Morgan’s successful legal action against Esquemeling’s publishers for libel (he was awarded £200 in damages). Interestingly, Morgan’s complaint did not relate to any of the graphic descriptions of torture or to his ruthless mercenary attitude, but to a short passage which appears to have offended his pride by suggesting that he was an indentured servant during his early years in Jamaica.